The thin spread of development over great distances; the strict separation of residential buildings from those of commerce and industry; the caps on height and density: these conditions may now look like Los Angeles’ most crippling and intractable disorders, but they once promised a cure for all that ailed the American city. The bigger Los Angeles boomed in the late 19th and early 20th centuries, the more those in charge of its form did to retain the feeling (or so they imagined it) of the small inland towns from which so many new Angelenos had arrived. To others this unusually low-rise new city offered an escape from the much-bemoaned “dark, walled-in streets” amid “concrete canyons” of the industrial metropolises of the east coast and Europe. 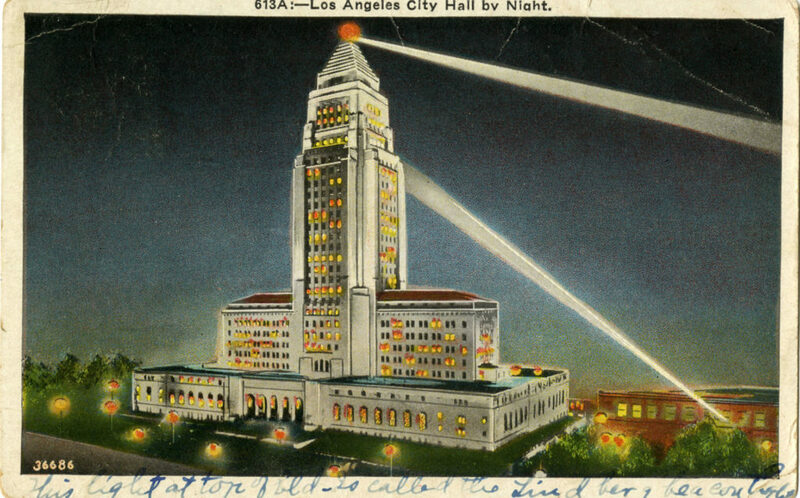 And so, for 36 years, just one structure loomed especially large over Los Angeles’ undisturbed horizontality: City Hall. A 1905 ordinance having prohibited the construction of buildings taller than 150 feet, for many years “you couldn’t see the Los Angeles skyline from the City Hall observation deck,” as Los Angeles Times architecture critic John Pastier put it, “because you were in it.” But you could see the results of a resolve, spelled grandly out in a 1910 city planning committee report, to arrange “the development of our great city along broad and harmonious lines of beauty and symmetry.” Those words evince the local influence of the “City Beautiful” planning movement then in vogue across the country, as does the design for Los Angeles’ Central Library by Bertram Goodhue as well as that of the next important building that went under construction: City Hall, designed by the trio of John Parkinson, Albert C. Martin, and John C. Austin, the leading architects of 1920s Los Angeles. The city’s municipal government had occupied five different locations over the previous 75 years, starting with a rented hotel in the 1850s and by 1888 occupying an acclaimed Romanesque Revival building on Broadway. (“An honor to the commonwealth,” the Los Angeles Times said of the structure which has since become a surface parking lot next to the newspaper’s own garage.) But the time had come for a more serious work of governmental architecture, which, under the banner of Allied Architects, the dream team of Parkinson, Martin, and Austin looked more than able to provide. As the designer of the Braly Block, the Security Building, and the A.G. Bartlett Building, then the three tallest in Los Angeles, Parkinson had already contributed to the city much of what height it had. Austin brought to the table a monumental sensibility developed in projects like the Hollywood Masonic Temple and Shrine Auditorium. Martin, founder of the architectural firm that would grow over successive generations into the formidable A.C. Martin Partners, had drawn up the impressive Thomas Higgins Building and Million Dollar Theater downtown. This was written by Colin Marshall. Posted on Friday, October 20, 2017, at 3:47 am. Filed under architecture, Los Angeles, Los Angeles in Buildings. Bookmark the permalink. Follow comments here with the RSS feed. Comments are closed, but you can leave a trackback.